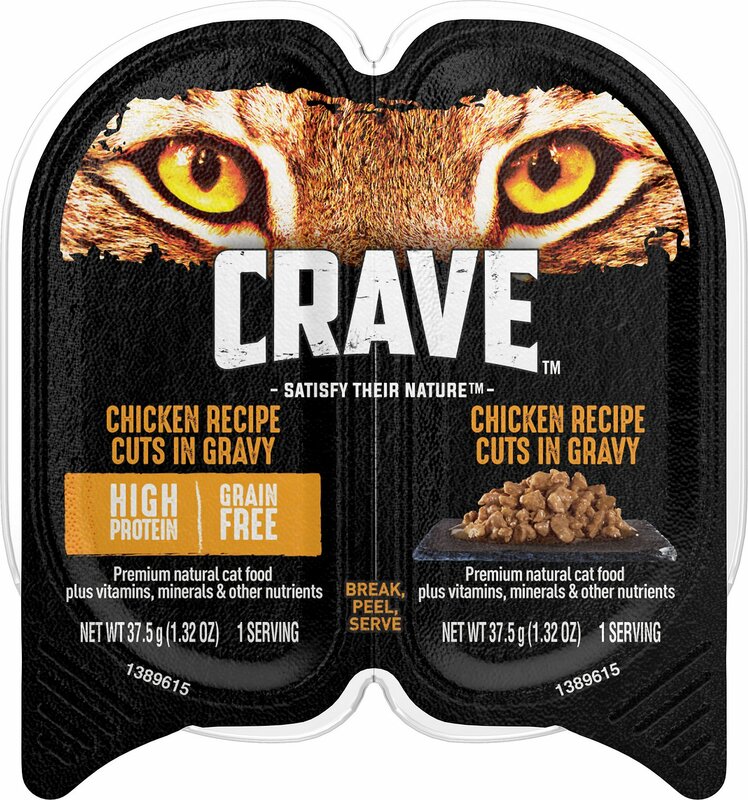 Satisfy your cat companion’s cravings with Crave Chicken Recipe Cuts in Gravy High-Protein Grain-Free Adult Cat Food Trays! 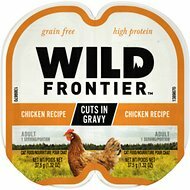 This protein-rich wet cat food is based on your feline’s primal, ancestral diet and crafted with real chicken. Feed your tabby’s inner tiger with the high protein and balanced diet she needs to support her muscles, digestion, energy level and a healthy immune system. Made without grains, corn, wheat or soy, Crave premium wet cat food is made right here in the USA with high-quality ingredients. Once your feline gets a taste of this recipe, she will be craving Crave for every meal! 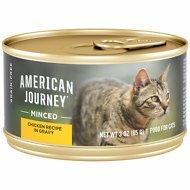 Made with real chicken to provide cats with the meaty flavor they love and the protein-rich diet they need. High-protein cat food provides cats with essential nutrients to help aid digestion and support healthy immune systems. Made with no animal by-product meal, corn, wheat, soy, artificial flavors or preservatives because your feline deserves nothing but the best ingredients. Grain-free cat food is inspired by your cat’s natural ancestral diet and proudly crafted in the USA with care. This Crave wet cat food recipe is specially formulated for adult cats and contains 24, 2.6 oz. trays—that’s a total of 48 servings! Chicken Broth, Chicken, Chicken Liver, Pork Plasma, Chicken Heart, Tapioca Starch, Potassium Chloride, Salt, Dried Tomato, Magnesium Sulfate, Xanthan Gum, Sodium Acid Pyrophosphate, Tetrasodium Pyrophosphate, Choline Chloride, Taurine, Sodium Hexametaphosphate, Thiamine Mononitrate (Vitamin B1), Vitamin E Supplement, Zinc Sulfate, Ferrous Sulfate, Manganese Sulfate, Copper Sulfate, Pyridoxine Hydrochloride (Vitamin B6), Potassium Iodide, Vitamin D3 Supplement, Folic Acid, Menadione Sodium Bisulfite Complex (source of Vitamin K Activity). 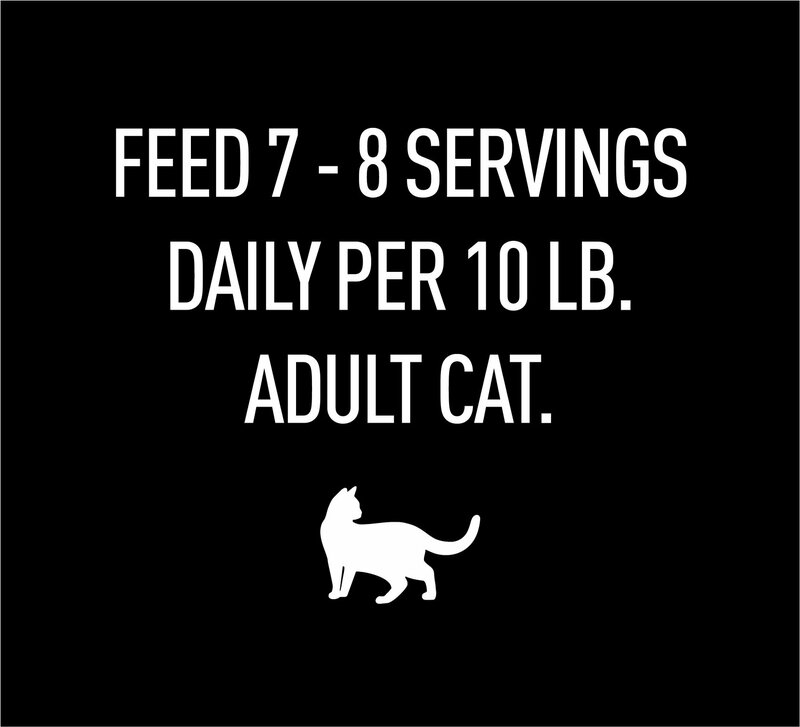 Feed 6 to 7 servings daily for every 10 pounds of adult cat's body weight. Each recipe is inspired by the diets of cats' ancestors. Your feline will love the high-quality protein that Crave cat food formulas provide. They are designed to deliver the proper nutrients for a lean physique and the much-needed energy to live each day to the fullest. All recipes have no chicken by-product meal, corn, wheat, or soy protein. Crave dry cat food is a 40% high-protein diet that was inspired by the diets of cats' ancestors. Cats thrive on a high-quality animal protein diet that supports a strong, lean body. These recipes are grain-free with quality carbohydrate sources for energy. Try Crave with Protein from Chicken & Salmon for your indoor feline, or try Crave with Protein from Chicken or Crave with Protein from Salmon and Ocean Fish for a diet that's bound to entice their ancestral appetite. Premium patés are a break, peel and serve away! These easy-to-open wet cat foods are crafted with 12% premium protein to help your cat thrive and to fulfill their desire for a meaty meal. One tray equals two servings of a delicious, unforgettable meal. These satisfying wet foods also have added vitamins, minerals and other valuable nutrients. Cats instinctually desire protein rich diets, because that's how their ancestors ate in the wild. Crave cat recipes deliver high quality animal protein as the first ingredient to help them maintain lean bodies and help provide cats with the energy to chase. All cats share a connection with their cat ancestors. Crave cat food helps you cater to your feline friend's instinctual needs with the protein-rich diet they are hardwired to eat. 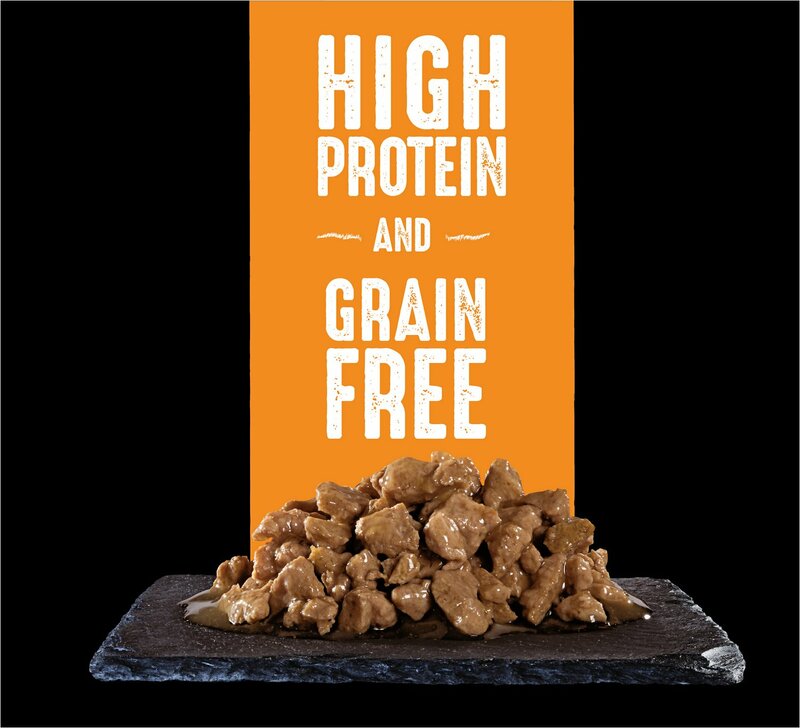 That's why Crave recipes are grain-free and always crafted with real, high-quality animal protein that's just plain delicious! My cats ate half a tray and left the rest to dry in the bowl. On the other hand, the feral colony that I help feed in my neighborhood loved it. I'm just happy the food is all gone and it didn't go to waste. A note on the packaging: The foil is extremely hard to remove. The plastic trays are #7 so I couldn't recycle them. My picky eater has really taken to this Crave chicken food. She never turns away from it. I’m happy to have found a food I know she will always eat. This is not her favorite but it does add variety. What she doesn't eat goes to Barney the Barn cat. I doubt he will ever look for another place to live. My cat likes it and she is very choosy. She also only will it cuts and chicken and will not even try pate or other meats. We tried five or six different brands and that is the only one she will eat. The only reason I gave it 4 stars is because it is actually cheaper to buy at the store (you, however, have to go, pick it up and carry it home. Decided that Sofia needed a new "grain-free" wet food after for 5 plus years eating "Beyond" and assure its boring to eat the same thing day after day. Tried "2" new choices for Sofia in the Crave wet food; chicken in gravy and beef/chicken in gravy. Gravy is a #1 preference for Sofia! After trying both new Crave wet food selections; beef/chicken in gravy was a HUGE HIT! NOT THIS CHICKEN RECIPE AT ALL? HAD TO THROW IS OUT? So I will try the Crave beef/chicken in gravy alternating with Beyond to see if that continues a winner. 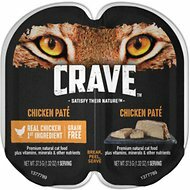 I was excited to see Crave had a product that was in bites instead of pate`. Unfortunately, it is not agreeing with my older cat so we will be going back to the pate`. I don't know if the issue is the consistency or if the recipe is different. My cat has to be on a strict diet because of her sensitivity with basically all cat food. Crave has seriously been the only one that she actually enjoys and helps her coughing/vomiting. It's also a good price compared to other grain free foods.